I love unseasonably warm weather. J and I were catching up on some missed episodes of Diner’s, Drive In’s, and Dives this morning. Last night’s show was all about BBQ. 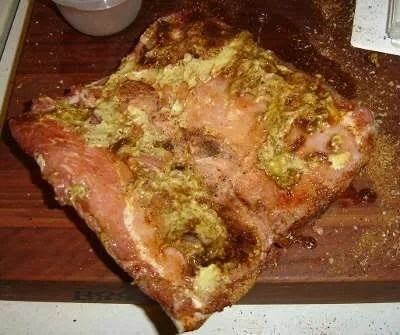 That made me crave a slab of pork. 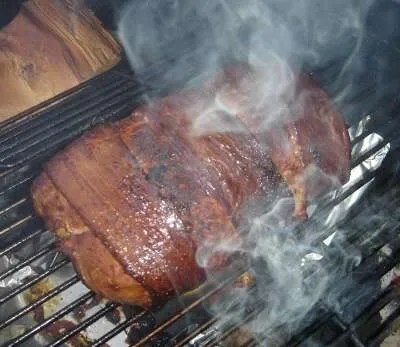 J kept saying I needed to do something to get out of the house today since it was so freakin nice, so I thawed out a pork loin and decided to fire up the BBQ. So, what exactly is my first BBQ of the season? 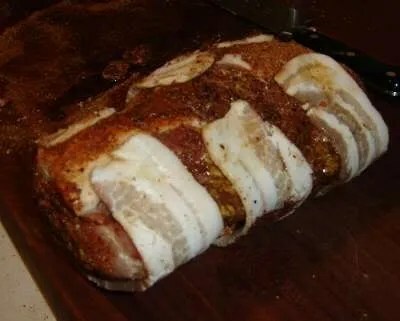 It’s a Tennesee Pork Loin. 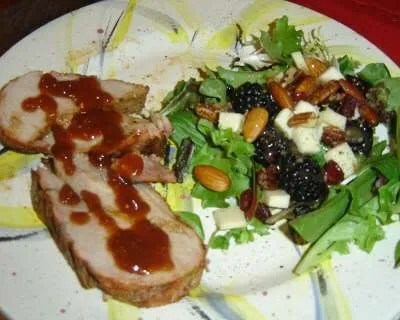 A recipe I took and modified from BBQ U. I like my dry rub better, but mostly everything else is Steven Raichlen’s. There was a glaze in the original recipe, but I dropped that to save some calories. It’s still delicious without out. Butterfly the pork loin. Sprinkle inside of roast with 2 Tbsp of the whiskey. Let rest for five minutes. Sprink BBQ rub on top of whiskey. Spread Dijon mustard on top of rub then top with brown sugar. Close up the loin and sprinkle with more rub. Wrap bacon around the loin and tie with butcher string. Set up grill for indirect grilling. Add wood chips and smoke over medium heat for 1 1/2 to 2 hours. Let rest for 10 minutes. Serve with BBQ sauce. Original Recipe – As you can see, I’ve taken a lot of steps out. Mostly just to take out excess sugars. 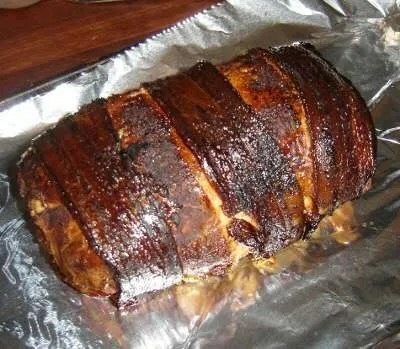 The pork loin still tastes delicious. It smells like summer in here…..
Update 5:53 PM – I realized I forgot to mention something. I added the brown sugar that the recipe calls for because I don’t use brown sugar in my rub. This is a little over an hour into the cooking. Update 6:31 PM – The loin is done. Unfortunately, J won’t be home for another 45 minutes, so it’s wrapped in foil and hanging out in the closed up grill until then. Here’s what it looks like completely finished…delicious looking, huh? Update 8:14 PM – Dinner was delicious! There’s only a little bit of the loin leftover. Here’s what J’s plate looked like. I added a little bit of BBQ sauce to hers. Is it 7pm yet???! I can’t wait to come home for dinner!